Composer Danny Elfman and the BBC Concert Orchestra performed a selection of music from the films of Tim Burton, from Edward Scissorhands to Alice In Wonderland, showcasing a comprehensive collection of kooky musical magic in the lavish surroundings of the Royal Albert Hall. 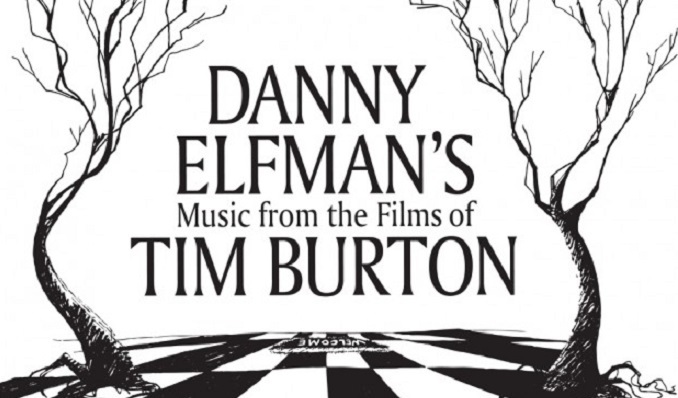 There are few creative collaborations that have yielded such marvellous and unique results as the union between Director Tim Burton and Composer Danny Elfman. It’s simply impossible to understate how much of a debt Burton’s work owes to the haunting, beautiful and anarchic soundtracks Danny Elfman has given them. Burton is often praised for his wondrous dark visuals, but they would be utterly robbed of magic and personality without Elfman’s music. Elfman’s distinctive sounds gave Big Fish it’s whimsy, Batman its heroism and Pee-Wee his hysterical energy. It’s a rare privilege to hear them all performed by a premium quality orchestra under the expert conduction of John Mauceri. It’s especially fascinating to see Elfman’s trademark sounds created live, with crashing drums and trumpets mingling with the haunting harmonies of the Maida Vale Singers. An array of strange instruments and frantic orchestral work matches perfectly with a giant screen showing memorable artwork and clips from Burton’s accompanying films. Fans were also treated to a surprise performance by one of Tim Burton’s other loves/muses. Helena Bonham Carter took to the stage armed with huge hair and gothic charm to croon her way through Sally’s Song. What she lacks in vocal power she easily makes up for in sheer stage presence. The undisputed highlight of the night is when Elfman himself took to the stage to perform a medley of songs from cult classic The Nightmare Before Christmas. His theatrical performance and jerky dancing compliments a stellar vocal performance as Jack The Pumpkin King. Elfman’s obvious glee at getting to personally bring his beloved songs to one of the most famous stages in the world is infectious, spreading quickly from the front row to the farthest comers of the theatre. Throughout the hall endless rows of spectators sat happily captivating by Elfman’s eerie melodies. In truth the only slight disappointment on an otherwise rapturous night of musical celebration is that the performance is limited to Elfman’s endless collaborations with Tim Burton. Elfman is responsible for so many iconic scores, from Spider-Man to The Simpson that in an ideal world the programme might have sacrificed less adored works like Planet of The Apes in favour of a little more variety and those crowd-pleasing favourites. Danny Elfman proudly proclaimed the night to the best of his entire life. Many of the ecstatic audience seemed to share that sentiment, honouring his eccentric genius with frequent bouts of thunderous applause and eager standing ovations. Seeing Burton and Elfman stand hand in hand at the final curtain call is the perfect way to draw a close to over two hours of musical magnificence.